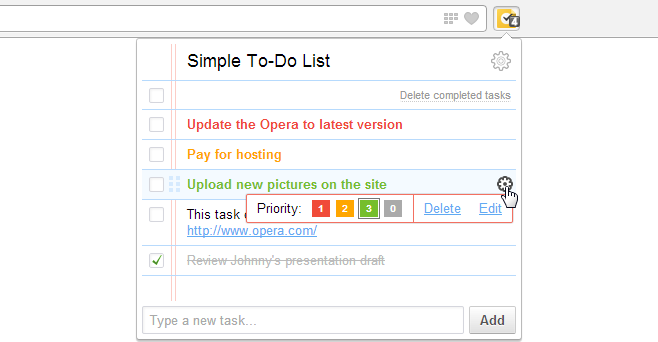 Updated 2016.10.04: Since I no longer use Opera browser, new versions of extension now available only in Chrome Web Store – Simple To-Do List. Clickable links in the text. Drag-and-drop support for tasks. Move your mouse over the task and you will see an area that allows you to drag and drop. You can set a priority for a task. From 1 to 3. You can change CSS styles for a task font and change colors for tasks with priority. Support for data synchronization (does not work in Opera at the moment). If you find a bug, feel free to report about it below in the comments. Doesn’t work simple to-do list for Chrome. I’ve tested on Chrome 31.0.1650.57, works fine for me. I like your SIMPLE TO DO LIST creation. It could be me, but I do not find a way to have it sync with my Android, Nexus 6 (shamu), with the new Lollipop OS. Am I not seeing it? Or, is it not able to be synced to the Chrome on my phone? Chrome version on PC Version 40.0.2214.85 beta-m (64-bit). Any reply towards resolution is appreciated…. Sorry, that’s not possible. Synchronization works only between desktop PCs. Make online synchronization and reminders by date and time. And then it will be the best organizer expansion for the opera. Re: You can save the selected text on a page as a task by context menu. Where does it save it when using Chrome or does this work for Chrome? For some reasons this feature does not work in Chrome. I did not know about it. I found the solution. Will be fixed in next version (most likely in January). any plan to deliver it to firefox? Great small addition would be to record completion date, in order to be able to simply generate a daily/weekly/monthly report. Export data as csv would also be nice. Auto save feature would be great. When you don’t hit enter it would still save. I’m not sure how synchronization across PCs is supposed to work by Chrome, it doesn’t seem to. I’m not sure how the data is stored, but if you could choose where to store the data file, such as in a Dropbox directory, then synchronization across PCs would be easy, and could even be shared across people working together on a project. Mike make sure all of Chrome browsers in all of your PCs have sync turned on under Chrome settings. Works fine for me. Can you make two or more lists in it, please? Like in tabs or something. So that it can be turned on/off. do you have an andriod app by a chance? Sent you a donation today. This is one of my most used plug-ins. Thanks. New item to be on top of the list instead of bottom. Can I recover my deleted data, there was a first line showing me empty so I just selected and after deleting I lost all my data below that line, please help. Deleted data can not be recovered. Hi. Can I open Simple To-Do List main window in tab (instead of popup)? I’m opening index.html but it doesn’t work. It’s a pity. It could be very useful with a time-scheduler. It’s unfortunate that you don’t have an Android App for this like Evernote, ToDo-ist, etc..
LOL man you so arrogant, sadly. Can you make the HEIGHT of the box adjustable, just as the WIDTH is now adjustable. I am happy to pay you to add this feature. Unfortunately, browser engine does not allow to change the height.